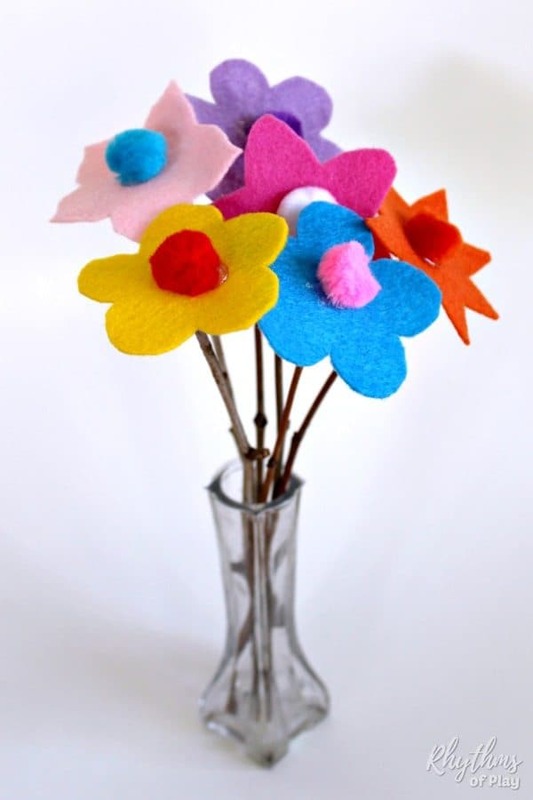 Use the free felt flower pattern printable template to make easy felt flowers with twig stems. 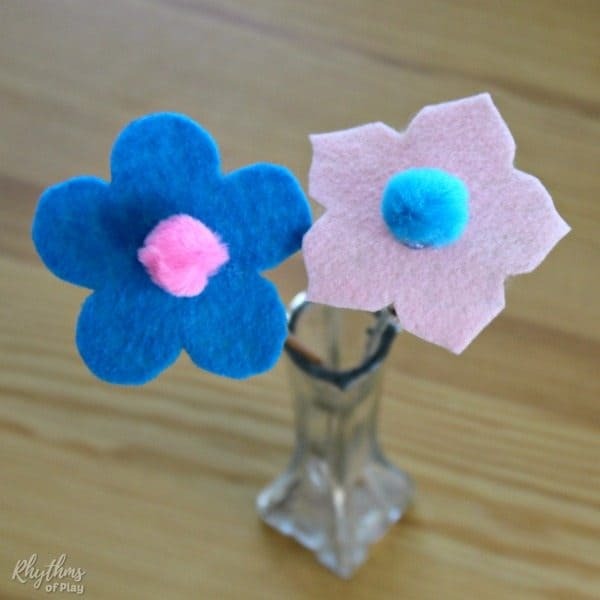 These DIY felt flowers are a no sew felt craft and gift idea for kids, teens, and adults. 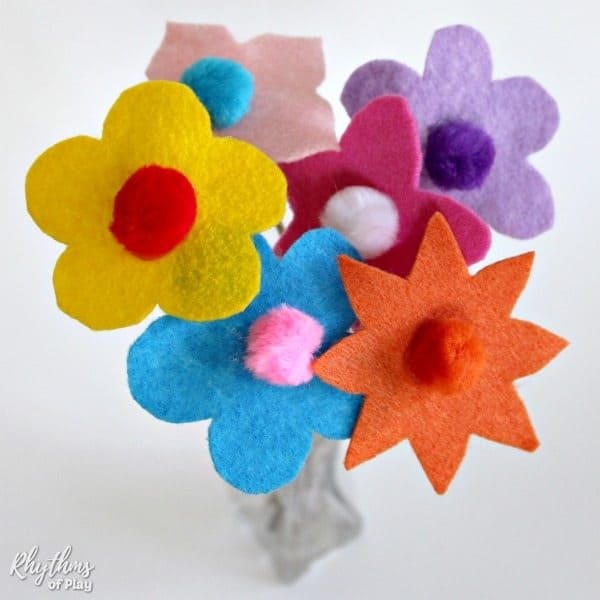 Give mom a felt flower bouquet for Mother’s Day or just to say I love you any day of the year! 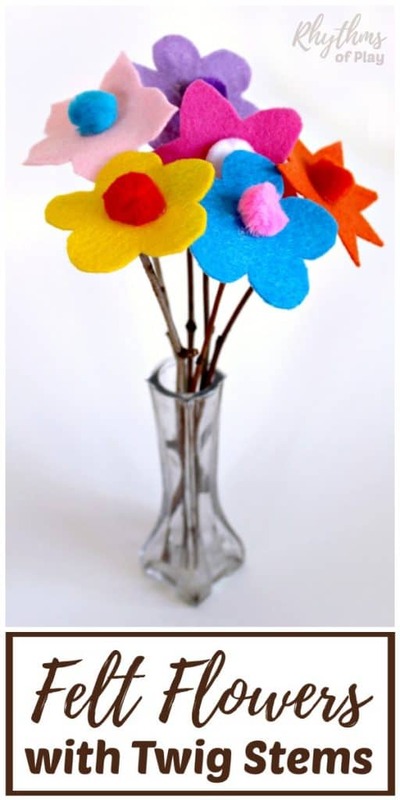 Use felt, pom poms and twigs to make felt flowers and felt flower bouquets. Making flowers out of felt is an easy craft for kids, teens, and adults. First, go on a nature hunt to collect some thin bare branches or twigs to use for flower stems and flower bouquets. Second, gather the materials listed for one of the 4 ways to make flowers out of felt listed below. Last, follow the easy step by step directions beginning at the step directed for the felt flower craft option that you select. Download and print the free printable flower pattern. Begin tutorial at step 1. 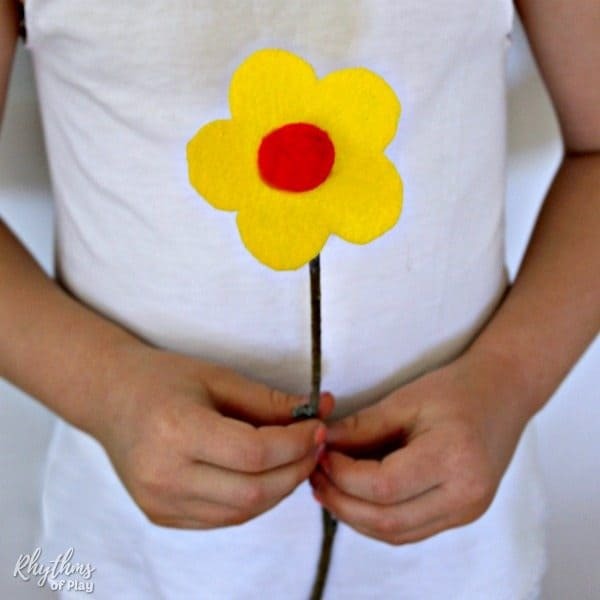 Create your own felt flower templates. Begin tutorial at step 2. Use a flower cookie cutter. You will need everything listed in the materials section below except for the cardstock. Begin the felt flower tutorial at step 3. Order pre-cut felt flowers HERE or HERE. Begin the felt craft at step 5 if using the pre-cut felt flowers. You will only need twigs, pruning shears, pompoms and a glue gun with glue sticks to complete this felt craft. **NOTE: The flower cookie cutter is about 4 inches in diameter, the pre-cut flowers range from 1 inch to 2 inches in diameter, and the printable felt flower pattern templates we provide are approximately 3 inches in diameter. Free flower pattern printable template, OR a flower cookie cutter, OR pre-cut felt flowers HERE or HERE. There are 4 different ways you can make felt flowers and felt flower bouquets with twig stems using this tutorial. Choose one of the 4 options above and begin at the step directed below. 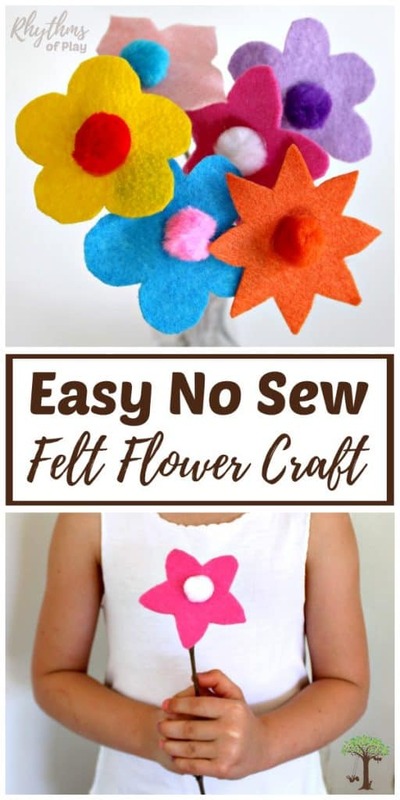 As another alternative Mommy Moment came up with another way to make felt flowers with twig stems that you can read HERE. Download our free printable flower pattern and print it out onto cardstock. Regular printer paper can also be used, but cardstock is better for making strong flower templates to trace. If you are not ordering the pre-cut flowers or using a cookie cutter to trace, cut the flower templates out of the free flower pattern printable. Alternatively, you can draw your own flower templates onto cardstock and cut them out. Trace the free flower patterns that you have cut into cardstock templates or a flower cookie cutter with disappearing ink. Yes, disappearing ink really disappears even on white felt! The ink can be washed away with water or it will disappear over time. **WARNING: Do not trace your flowers and leave them to cut out the next day or you may not have anything left to trace! Cut the flowers out of the felt. Felt is tricky to cut, make it easy on yourself with a pair of sewing scissors or small sharp precision scissors. Use pruning shears to trim thin bare branches and twigs down to the desired height. 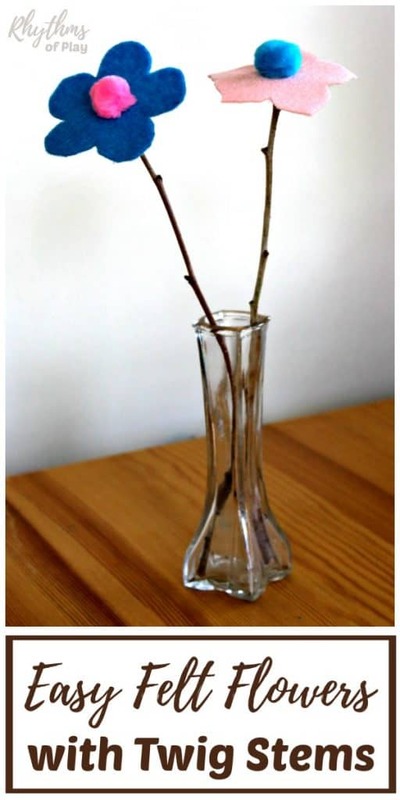 Measure the height by standing the twigs next to a vase before you cut them. Trim both ends for a clean look. Fold the flower in half to cut a very small hole in the middle of it. Thread the tip of a twig through the small hole in the flower. Use a glue gun to glue a pompom onto the tip of the twig and the felt flower to secure it in place. Place your gorgeous flowers in a vase or tie a ribbon around them to create a handheld bouquet of flowers. Single flowers in a vase or with felt leaves glued to them are also lovely. Optional: Use your felt scraps and extra pompoms as a colorful vase filler! Single flowers and handheld bouquets of flowers made out of felt are an easy gift idea for kids teens and adults. Give mom (or grandma) a single flower or a whole bouquet for Mother’s day or just to say I love you any day of the year! Another gift idea for mom is a handprint art jewelry dish or anything from this awesome collection of homemade gift ideas kids can make. Signed up to get your printable template and of course, clicking on the link just makes it go in an endless circle wanting my email address. Lovely click bait. Thanks.